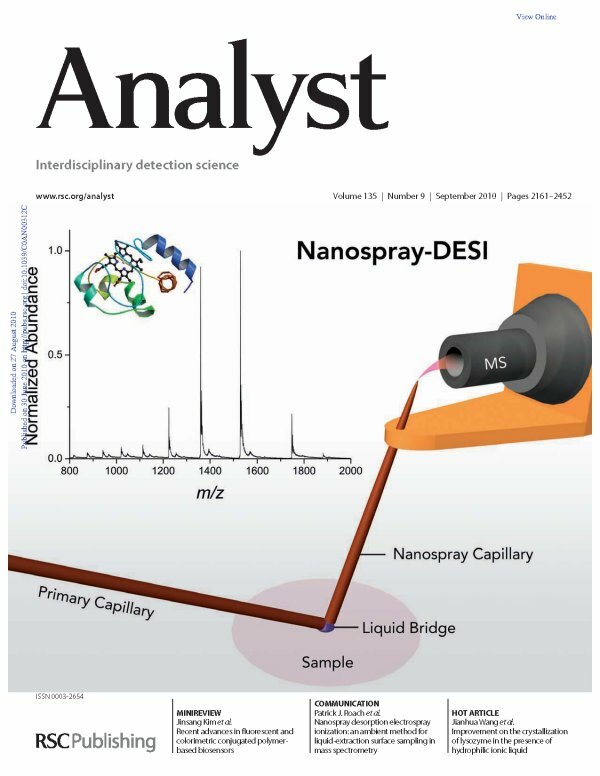 A recent paper on nanoDESI by Dr. Patrick Roach, Dr. Julia Laskin, and Dr. Alexander Laskin of Pacific Northwest National Laboratory was one of the five most accessed articles in Analyst in September 2010. In the article, the team describes their new approach, known as nanoDESI or Nanospray Desorption Electrospray Ionization. This approach enables rapid and sensitive analysis of molecules adsorbed on solid surfaces using mass spectrometry. The technique is able to lift both relatively small delicate molecules and fairly large proteins off substrates for subsequent analysis. The interest in this article, which also graced the cover, revolves around nanoDESI's ability to work with nanogram-sized samples. Scientists can get detailed information from samples much smaller than those used in other approaches. This means sample collection can cost less, take less time, and in the case of some samples, such as blood-based proteins, less pain. Also, the nanoDESI approach lets scientists skip the laborious sample preparation process and still get precise data. Acknowledgments: Funding was provided by the Department of Energy's Offices of Basic Energy Sciences and of Biological and Environmental Research, and the EMSL Research and Capability Development Intramural Program. The nanoDESI is located in EMSL, a national scientific user facility located at PNNL. The capability is available to users through EMSL's proposal process. Reference: Roach PJ, J Laskin, and A Laskin. 2010. 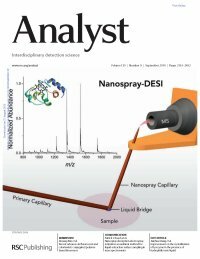 "Nanospray Desorption Electrospray Ionization: An Ambient Method for Liquid-Extraction Surface Sampling in Mass Spectrometry." Analyst 135(9):2233-2236.